While we were researching the AudioCubes, we ran into this amazing DJ system by designer [Scott Hobbs]. 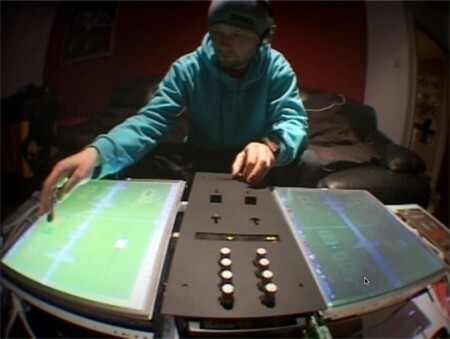 He calls it the ATTIGO TT, and it uses two touchscreens to simulate the turntables on a conventional system. More technical details after the break. Hobbs’ goal in making the ATTIGO was to create equipment that would allow DJs to play MP3s the same way they would play vinyl records. The first step was finding an adequate touchscreen. Hobbs bought two 17″ touch-screen overlays and put them in a custom wooden housing, then attached both screens to a mixer. The screens display the waveform of the audio, and the user can touch the waveform at any location and drag it back ad forth across a line in the middle of the screen. The music plays faster, slower, or in reverse depending on the user’s motions. The software that controls the ATTIGO is Max/MSP with a custom patch for the touchscreens. For the graphical interface, Hobbs used Flash, with Flashserver acting as the bridge between Max and Flash. The application register s contact with the touchscreen as mouse clicks, and it also recognizes and uses various other mouse states (individual clicks and extended mousedown moments). It’s great to see a new interface that goes beyond what FinalScratch and Serato have done recently. Hobbs is currently searching for a manufacturer for the ATTIGO, so you’ll have to wait until then to snag one for yourself. Until then, enjoy this video demo of the ATTIGO in action. However, for traditional DJs, this is not particularly great. One of the greatest things about vinyl is you get tactile feedback. For instance, you can drag your finger on the edge of the vinyl to slow down the playback–and you can feel this without looking! Many DJs won’t move to CD decks because of this. The reason why CD decks (since the first, the Pioneer CDJ-1000) have been trying to emulate the vinyl feel is to give back some of that feedback to the DJ. I used to DJ (trance, not hip-hop/scratching/etc), and I’ve used vinyl, cd decks, and hybrid solutions like finalscratch. Vinyl is expensive, doesn’t hold much audio, and is bulky. CDs are great, but they don’t give you the same kind of tactile feedback as vinyl does. The only negative of finalscratch/etc is that the playback is still affected by bumping the table, etc. This looks stunning, but I dont think this is going to prove at all useful. The problem is that there are already better ways of doing the same thing, be it actual records or any of the digital hybrid solutions. The turntablist crowd will be let down I’m sure by the latency of the touch screen and the lack of precise control over the record. The techno/house/dnb crowd have slightly different needs in manipulating the record, mostly nudges to keep them in sync and you dont *need* a touchscreen for that if you’re playing digitally. can’t you do this with two itouch? This system Seems very clunky. The video just proves that you can have all the flashy tech in the world, but it still wont make you a good DJ.